Beth Ann & Jessica's Helpful Savings: NoMoreRack: Cuisinart Supreme Grind Automatic Burr Mill $31 Shipped w/$10 Coupon! 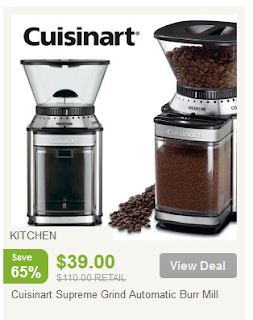 NoMoreRack: Cuisinart Supreme Grind Automatic Burr Mill $31 Shipped w/$10 Coupon! This Cuisinart Supreme Grind Automatic Burr Mill is just $39 on NoMoreRack (retail $110), but with this $10 coupon to NoMoreRack, you can get it for $29 plus $2 shipping!